This week’s Website of the Week goes to The Paul O’Grady Show. This website’s design as well as its build process can only be described as passionate and show-stopping. It was an incredible feat of organisation and teamwork from everyone involved and was completed in a record-breaking one day! This was quite an achievement for Toolkit Websites and we are very proud to present this website to you to explore and hopefully come back and visit regularly in the future. The birth of this website marks the return of The PaulO’Grady Show to ITV. 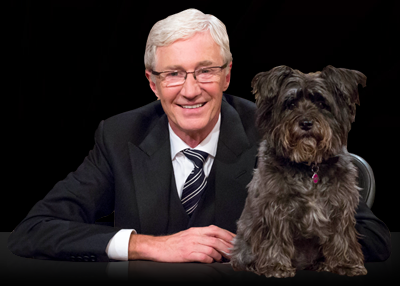 Beloved comedian, Paul O’Grady, delights viewers every weekday at 5pm with a variety of entertainment including performances from current musical artists, light-hearted talks with special guests and even competitions for viewers at home to take part in. As well as needing a complete website within a short time, the client also needed to be able to update the content frequently, announcing the line-up for the show every day ready for the evening show. Both the design and the content of the website are strong and are an asset to the programme itself. All elements of the custom dressed Home Page will be instantly recognizable to viewers of the show and can be identified from the opening credits to actual set pieces used. It makes the most of the dramatic logo that features the show’s title as well as the theatre-esque background and the ‘name in lights’ font style. It all follows this elaborate broadway theme right down to the smallest detail; note in particular the charming, custom social media and email icons. The design of course is crucial to this website’s championing of The Paul O’Grady Show, but it is the content that adds the substance. Using The Toolkit Editor, the client is free to add relevant information, links to supporting sites and even create new pages, at will. This is a great opportunity for a programme that is shown on a daily basis as it keeps viewers informed, updated and even adds that little extra sense of a shared experience through the mighty network that is the World Wide Web. For example, if you take a look at the site currently, you will notice a page has been especially created detailing information about the endearing dogs that were featured on Monday’s episode for the people at home and potential new owners. Overall, it’s obvious that while The Paul O’Grady Show and this website were created to entertain, with its rich design and strong branding, it only decorates its heart and true purpose which is to bring happiness to homes around the country and to raise awareness on issues very close to the client’s heart; all of which is perfectly embodied by the picture of its two stars found on the Home Page. The client was also happy with the site, stating that they found the whole process positive and that they were especially impressed by our ‘fast and professional response’ before giving us 5 stars. Read a previous blog post here that talks about other instances in which Toolkit Websites went above and beyond to meet tight deadlines.